PDS series portable digital storage oscilloscopes embody completely the perfect combination of capability, speed and analysis. With 40-60M bandwidth, 250MS/s real-time sample rate on each and dual channels storage, PDS6 series would be the ideal instrument for design, maintenance and detection. With advance trigger, we could capture the waveform quickly and improve the efficiency greatly. The trigger functions include: Edge trigger, Video trigger and Alternate trigger. This function reduces random or noisy in the signal effectively and quite convenient for the engineer to analyze the waveform by. Below figure is the waveform which achieved after averaging which to show how this function reduces the influence from noisy directly. Multi-math operations help to meet the test requirement of lab engineers. To test pulse or single signal. After the oscilloscope detects a trigger, itcompletes acquisition and locks the waveform. To input two different signals simultaneously. 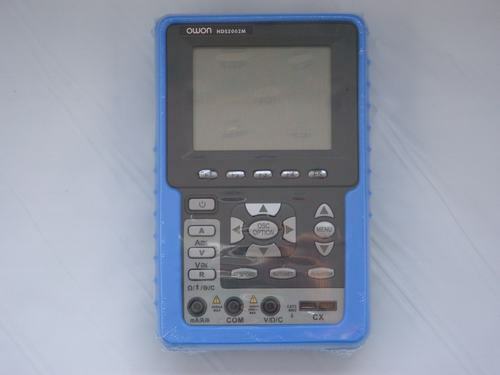 This portable scope can be used as USB scope as well, the user can view/measure/save/print waveform on the PC; view and set the horizontal time base of each selected channels; can view and set the Voltage Scale of each selected channels; also the Period, Frequency, and Peak Value of selected waveforms can be displayed. The chargable lithium battery can be used up to 5-6 hours. Three-years warranty from the manufacturer, the manufacturer will pay for shipping if there is any problem with it.